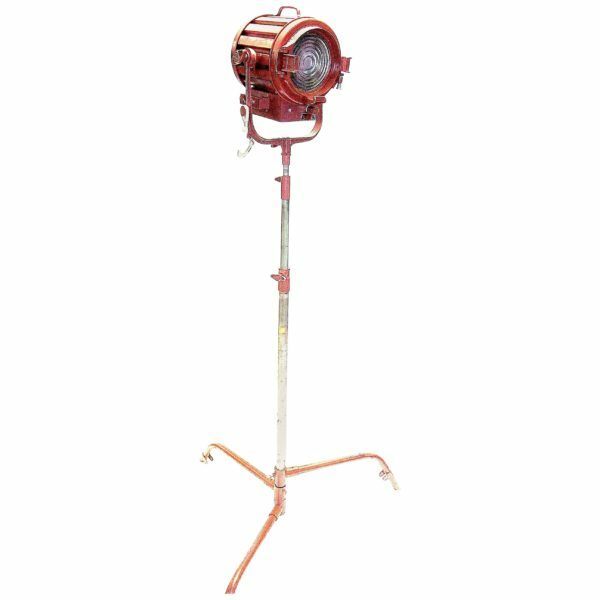 Submitted for your approval, this factory correct, circa mid-20th century Hollywood motion picture 1000 watt Fresnel spotlight, made by the Mole Richardson Company of Hollywood CA. 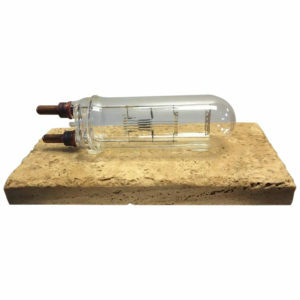 It is offered in the factory correct original color with all mechanicals and electrics intact, but we have added a practical household lamp system modification for use at home, on display or at the office. Original factory paint shows normal patina from professional cinema studio use. We will clean and detail to suit buyers requirements at no extra charge. 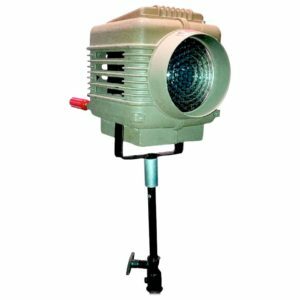 These type of solar spot lights have been used in the motion picture industry since the early 20th century and were the standard of Hollywood. 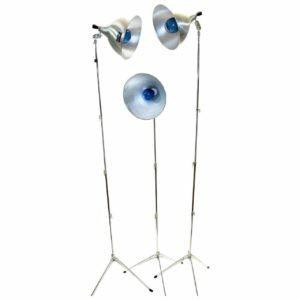 This fixture comes complete with factory correct and height telescoping light stand (not the display stand pictured but a rolling castered stand of a similar size) and with the original Fresnel lens and original internal reflector. 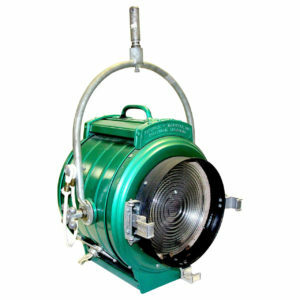 The rolling Hollywood type factory stand is supplied at no extra cost. The stand can typically be adjusted to rise up to 7′ or be set on a low height of around 4’6 inches. The stands are usually more patinated that the light fixtures due to the style of use and transport methods during filmmaking.